It had been a daily demand, that. The box, with its seven large glass marbles葉he banded red one with a darker crimson line at the approximate position of the equator and pale ice-cap-like splotches on either 'pole', the green-and-white one with pale blue blotches that seemed to shift and change if you looked on them long enough, the blue-and-white one, the mustard-yellow one with red streaks, the drab brown one with its points of blossoming scarlet, the pale grey one with its long darker gray pools ,the one with blue swirls with gllints of gold underneath. The old man would take them out of their wooden box and hold them in the palm of his seamed hand, one by one, until they warmed to his skin. Then he would sigh, and return them to the box, and replace the lid, and hand the box back to his grandson to take back to the display cabinet. "They will be yours one day," he would say, every time, like a litany. "They are the only thing of real value that I have to leave to you. This will one day be yours." The glass-fronted cabinet in Andrash's grandfather's house was an antique擁t had belonged, according to family lore, to his grandfather's own grandfather once, which made it, in cabinet years, practically immortal. The stuff displayed within had been collected over the years, much of it only of sentimental value, other things obviously valuable, yet others of questionable and probably indeterminable worth, to be set only at the estate sale after the old man died. Andrash was the only grandchild, the only heir葉he only son of his grandfather's only daughter. It seemed that the family line was wearing awfully thin, by the time it came to Andrash himself. He sometimes wondered whether he himself would produce a single offspring (as seemed to be mandated), or buck the odds by either providing a litter of scrambling brats instead of the requisite staid only child熔r else if he would be the one who put a stop to it all and never procreate at all. Either way, he was the inheritor of whatever the old man chose to leave behind him when he shuffled off this mortal coil at last. He'd been ailing over the past several years, growing steadily weaker until finally for the last six months or so he had been almost entirely bedridden and wholly dependent on Andrash (when he was there) or the neighbors, or else the visiting nurse who paid regular visits to ensure the patient's medical status quo and check on his medications, serried ranks of which seemed to fill his bathroom cabinet and his bedside table, more every day. It all added up to a tidy sum every month葉he meds, the nurse, the whole being sick thing. The old man lived in a tiny house which had itself seen better days預 house with old-fashioned wallpaper and wainscoting in its parlor, with a square footage that modern-day buyers would laugh at預 house which had never heard of appliances like a dishwasher and would probably have to be rewired from scratch to support one, and a terrifying lack of bathrooms and closet space. It would have to be sold when the old man went, to be sure, but Andrash did not hold out any great hopes of getting much out of it at the end. Its furnishings were of the genteelly and elegantly shabby sort, the kind of thing that had seen a decent amount of use and was nearing the end of a long and productive lifetime, but not of much use or value to anyone else. Like the glass-fronted cabinet in the front room, and the things it held. Andrash had never really paid all that much attention to the contents of the cabinet溶one of it had looked all that promising, anyway. The only time he went in and out of there, anyway, was when he was retrieving the marble box for his grandfather, when the old man asked for it. The only thing of real value he had to leave, he had called that box. The only thing of real value. Andrash had walked past that cabinet a hundred times. A thousand times. He knew all the stuff that sat inside葉he kind of thing you might find in one of those jumbled so-called 'antique' stores which sold people's discards and castoffs, ancient crocheted shawls in neon-green yarn and snow globes with frozen cartoon deer inside and old comic annuals from twenty or forty years before or diamante hairclips with bits of glitter missing or old-style pocket watches which no longer functioned. Possibly parted with by their original owners with tears, possibly torn out of unwilling hands, one man's treasure, another's junk葉here was always money in it somewhere. But little enough, and Grandpa's life was beginning to be awfully expensive. More expensive than his own income could stretch to, some months. Andrash had reached for his own wallet more times than he cared to remember. He didn't care洋ost of the time葉his was his grandfather, after all, and he was the last family Andrash had left. His father had been a Hungarian adventurer with piercing blue eyes and a nifty moustache who survived only in a pale photo or two揺e was gone less than a couple of weeks after Andrash was born, his only legacy to the son he would never know being that preposterous name. Andrash had been raised by his mother, under his grandfather's roof葉his very grandfather, the one who now lay dying. Andrash owed him, for that, at the very least. But his mother had lived a quiet and bitter and miserable life, and a short one, as it turned out. She was two months shy of her fortieth birthday when she died, of complications from pneumonia. And after that, it was Andrash and Grandpa, nobody else. Andrash was full of a weird and unsatisfied fury these days. He was angry at the waste of his own life; he was angry that Grandpa was dying so slowly; he was angry that Grandpa was dying so fast; he was angry at a world which would leave him alone and adrift in that world once Grandpa had finished dying, and he was angry at himself for allowing a tiny flicker of hope that Grandpa's dying might change something, anything, give Andrash a leg-up on the ladder at the bottom of which he seemed to be languishing all of his days. He seemed suited to nothing, enthusiastic about nothing, just a brooding young man who earned money any way he could and smoked cheap cigarettes when he was out of the house in the hope that the old man would not smell it on him. But he was poor. He lacked容verything庸rom friends and family right down to nickels and dimes. If things had been different he might have amounted to something傭ut there had never really been the money to send him to good schools or to college and now he was too old anyway. The only thing of value. The damned marbles. Grandpa had stopped asking for them, after a while. He slept a lot these days. Andrash drifted through this period as though he himself was half-asleep, wandering through the hours of daylight with an aimlessness and a purposelessness that sometimes frightened even himself. Perhaps it was an instinctive reaction against that feeling that made him jerk open the doors of the display cabinet aimless close and sultry summer morning and grab something at random, anything at all, and then sidle out of the place like a thief in the night clutching his prize. He took it down to the corner pawn shop and offered it to the proprietor almost furtively, as though he had stolen it, as though it didn't almost nearly belong to him already anyway. The proprietor examined the item, a tiny crystal bowl which looked too small to be of any possible practical use, turning it over in his hands. "And, um, what were you expecting for this? Not much, I hope?" he said at last. "Whatever," Andrash said sullenly, his hands stuffed deep into his pockets, his chin tucked against his chest, the strand of hair that always flopped over his forehead slipping down over his right eye. "It's a couple of bucks, no more than that," the proprietor said. The sign on the shop announced that the establishment was to be addressed as "J. Rotherman and Son"; the guy talking to Andrash was so indeterminate in age that Andrash found himself in a furious and irrelevant internal debate as to whether he was the father or the son. Mr. Rotherman sniffed, put the bowl down on the counter, opened up his antique (of course預nything else would have stood out like a sore thumb, Andrash thought) cash register, and pulled out a couple of bills. "Here," he said, "I'm feeling generous." Andrash took the money預 crisp five and two tired and much-folded dollar bills預nd stuffed it and his fist back down into his pocket. "Anything of real value where this came from?" Mr. Rotherman asked, as if in passing, as Andrash turned to go. "Just the marbles," Andrash muttered. "That's what Grandpa said." Mr. Rotherman's eyebrow rose a notch. "Marbles?" "Big ones, Shooters. Grandpa has 'em in a box." "I guess. They've been there ever since I can remember." Mr Rotherman sniffed again. "You can show me those, someday. Some collectibles can be of interest. They could be worthless, mind." "Grandpa says they're not," Andrash said. "And he'd know," Mr. Rotherman said, sarcasm dripping from the words like oil. Andrash ducked his head even further forward, and left the place. The door set off a jangle as he wrenched it open; it always did that. It was annoying. Andrash slammed the door behind him with rather more force than necessary謡ith a strength born of that inchoate fury which still swirled inside of him, now leavened with guilt. He'd just sold off something that didn't really belong to him, sold it hell he practically gave it away, and now he knew that there were other small things he could pilfer if he felt like it, if he needed to take things out on something... and felt guiltier still for even thinking about that, for paying back the old man who had practically raised him with this, with petty thievery and with resentment, with anger, with this pent-up feeling that there should have been something he ought to have been doing with his life, something big, something important, but he had no idea what and he might have missed that train altogether already for all he knew. He lived in a grey fog of fear and frustration, seeing no further than the tip of his own nose. If only the old man would hurry up and die already. "He needs one of the prescriptions refilled," the nurse told Andrash as he slunk back into the apartment, the seven dollars burning a hole in his pocket as though they were on fire. Andrash took the pill bottle she was holding out to him. "I'll take care of it," he said. It would probably be a problem. The refills will have run out, necessitating a doctor visit. Or they'd be out of the generic again. There'd be a crisis in the morning. There always was. Andrash dreamed of playing marbles that night謡hich was odd, because he never had, as a boy. But in the dream he was deft at it, knuckling down to flick his blue-and-white shooter (where had he seen this particular marble before? It felt so right耀o hefty揺eavy but not heavier than it ought to be溶one of this made any sense...) and knocking out one mib after another out of the circle. He didn't know whom he was playing against, he never raised his eyes. He didn't even know if he was playing for funsies or for keepsies (where did these words come from...?) and it hardly mattered. The game mattered, that was all. He didn't know why he woke, in the first instant when his eyelids fluttered open預nd then he realized that he could hear groans from his grandfather's room. Suddenly very wide awake, Andrash knuckled away the last shreds of visions of marbles which still clung to the insides of his eyelids, flung his blanket off his legs, and stumbled out of bed. The old man was half awake, half asleep, in the grip of some strange nightmare; it took Andrash a moment to figure out the words he was muttering almost below the threshhold of hearing�I will make it right, I will make it right. Andrash, pausing briefly to wonder what kind of besetting sin weighed so heavily on his grandfather, busied himself with the physical things, with the only things he could help揺e gently shook Grandpa awake, whispering that everything was all right now, and then changed the bedding (Grandpa had soiled himself, and the pillowcase was soaking with something unspeakable, tears or drool or something, and could not be pressed back into service). He had hauled the old man out of bed while he performed these chores, and then helped haul him back into it again, and then stood at the bedside, hugging his shoulders with his hands and bleakly watching Grandpa drift back into a more peaceful sleep. "It isn't fair," Andrash murmured, his eyes stinging with something that felt like tears, although it had been years since he had cried. But he could not quite make up his mind about what he had been thinking of in the moment that he uttered those words謡hether it wasn't fair that Grandpa wasn't dead yet already, that if he had to live it was unfair for him to live like this, or that he, Andrash, had to be there to pick up the slack. There should have been a night nurse, or something. Somebody paid to sit up in a rocking chair all night and watch the old man sleep. Andrash walked past the glass-fronted cabinet for almost a week with his eyes averted. And then Grandpa had not one bad night, but three, one after another. By the fourth day Andrash was exhausted, blank-eyed, with dark circles underneath his eyes that might have been makeup laid on with a trowel. Perhaps it was that用erhaps it was no more than that傭ut on his way out of the apartment, out to get fresh air and some perspective, his hand snaked out as though with a mind of its own and opened the cabinet door and grabbed something else at random. It turned out to be an angel figurine預 fairly small one, but exquisite in detail, with some of the gilt paint on the wings chipping a little but still in good shape. Mr. Rotherman in the pawn shop turned it upside down, peering at the faded markings on the underside with a magnifying glass. "It's a little too gone for me to be certain but this looks like quite good quality stuff," he said. "Still. The paint chips, and all. And look, it might have a bit of damage on the wingtip様ooks recent悠 don't know, what say... forty dollars?" Andrash had fully been expecting another seven or ten. He could not stop an expression of astonishment creeping briefly over his features before he controlled them again. "Fifty?" he said, his hands in their usual fists in his pockets, holding a double handful of guilt strangled down there. "Forty three," he said. "And that is a final offer." The expression on the angel's face seemed to change, just a little, as Andrash walked out of the stupid door that rang him out as he left. An expression that shifted, every so subtly, into one of reproach. Mr. Rotherman asked, as if it didn't matter at all, about Grandpa's box of marbles as Andrash pocketed the angel money. Andrash muttered something incoherent in reply. The only thing of value, the old man had said. But the angel had fetched nearly fifty dollars. Who knew what else was in that cabinet of junk? He hesitated on the marbles. He took them out, looked at them again, shifted each one through his fingers. They all had weight, unexpected weight for their size; perhaps Grandpa was right and they were special and valuable. He dreamed of playing the game again, several times, every time with the blue-and-white marble as his shooter, winning dozens of small globes in the process, piling them all beside him like chips in a poker game. In the morning, when he woke, he checked the box, and the brown-and-red marble was still there. But the echoes of that derisive laughter stayed with him all day. Grandpa was still hanging on, if only by a thread, almost two months later. Andrash had not had a decent night's sleep in what seemed like weeks, and Grandpa's breath came thready now, as though he was only breathing as far down as his throat, as though his lungs were no longer involved. "It can't be long now, the poor man," Alice said, Grandpa's visiting day nurse, sponging down the old man's wasted limbs. "Can't you...give him something..." Andrash had wanted to ask, needed to ask, but the question still stuck in his throat. Alice looked at him, with pity. "It's hard on both of you," she said, her voice very soft. That was the day that he had taken the box of marbles, angrily, vengefully, with malice aforethought. What did it matter what Grandpa thought about the value? Grandpa was all but dead anyway. The marbles were his, Andrash's. He had been playing with them, for them, for keepsies, for months of long nights now. They were his. They were his. But he couldn't help hesitating outside the pawnshop door. For a long time. For a very long time, staring down into the opened box, almost as if he wanted to commit the marbles to memory. And he could not help reaching in and extracting that one, the blue and white one, the one that he had been using as a shooter in his night games. The others, but not that one. Not that one. He curled his hand around it, and then tucked the marble safely away into an inside pocket which he knew had no holes in it, just to be safe. Scowling, he closed the box on the rest and marched inside to Mr. Rotherman. They didn't look like much, the six remaining marbles, when Mr. Rothernan took them out of their box and laid them out on the counter one beside the other, examining each in turn. "Interesting," he said. "You said these were how old?" "I don't know," Andrash said, still scowling. "Grandpa's had them as long as I can remember, and he said he had them off his father, or maybe his own grandfather, I don't remember what he said now. And they may be older than that, even." "Which is odd," Mr. Rotherman said, "because early marbles葉he ones that would be as old as the ones you describe謡ere far more often made of clay with a fired glaze on top. These.... are all glass, and very fine glass at that. They seem to be old and yet they seem to be too perfect to have been made by hand as they would have to be if they were as old as you say. Which means that either they aren't as old as you say they are or else they're anomalies of an extraordinary degree熔ne or two, perhaps, but six...?" "I don't understand," Andrash said. Mr. Rotherman shrugged. "I would be more inclined to err on the side of caution," he said. "I'm the one stuck with them afterwards if I can't sell them on. Do you want to sell them all?" Andrash hesitated, but only for an instant. "Yes. Sure. Okay. Whatever." Mr. Rotherman sniffed, staring at the displayed marbles. "Well," he said after a long appraising look. "I don't know, I'm not an expert. But I'd say熔h様et's say two hundred dollars?" "That's generous," Mr. Rotherman said. The only thing of value, Grandpa had said. Surely the marbles had to be worth more than that. On the other hand...they were marbles. Marbles. Little glass balls that boys played with on street corners every day. Andrash sniffed, in an unconscious echo of Mr. Rotherman's own tic. 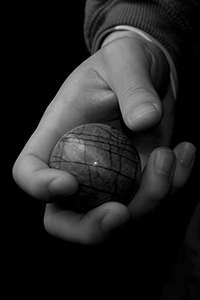 Mr. Rotherman picked up each of the marbles with his fingertips, with the utmost care, replacing them into their box. He then took a moment to tuck the box away into a drawer before he turned to the cash register to count Andrash's money out. That one small gesture screamed at Andrash that he had made a terrible mistake葉he marbles had to be worth far more than he was getting for them, if Mr. Rotherman was so tender with them. But it was done, and he was already holding the money, and the marbles were out of sight. Grandpa never asked for them anymore. Grandpa would never know. Would never have to know. Except... except that Andrash heard his name called as he softly closed the door of the apartment behind him when he returned home. His Grandpa's voice. Stronger and more lucid, more himself, than he had been for days. For weeks. "Andrash," Grandpa said, in greeting. "You look tired." "I'm doing okay," he murmured instead. He walked over to the bed and reflexively began to adjust the pillows into a more comfortable configuration, but his grandfather reached out and caught his arm, a surprisingly strong grip for the bare bundle of skin and bone and sinew that passed for the hand which was now wrapped around the bones of Andrash's wrist. "You are the one who will walk in my footsteps," Andrash's grandfather said, "and I may have already left everything too late. I didn't realize just how weak I had become. I don't know how much time I have left洋aybe days洋aybe only hours輸ndrash傭ring me the box of marbles..."
Andrash felt the blood drain from his face. His pinned wrist jerked, trying to escape Grandpa's grip, but was held fast, held even more strongly than before as the old man's grip, impossibly, tightened. Andrash knew that his grandfather's eyes were seeking his own but he could not lift his to meet that look. Could not. It was as though his gaze was nailed down on his grandfather's sinewy olive-skinned hand. "Tell me," Grandpa said. "Tell me the truth. Tell me now." "I... I...I, uh..." Andrash found himself scuffing the floor with his shoe, like he had used to do when he was a very little boy caught in some minor malfeasance or misdemeanor, unwilling to admit to his part in the matter and yet unable to deny it. But it had been a direct command. There was no getting around this. If he defended himself with a lie, it would only get worse, more tangled, more enmeshed. With his free hand, Andrash reached into the pocket where he had secured the blue-and-white marble and fished it out, and then held it out to his grandfather, nestled in his cupped palm. "Here," he said. "It's the last one left. It's the only one left." "I sold them," Andrash said, after a long and painful silence, hanging his head even further. "I'm sorry, Grandpa. I just...I don't know...I thought..."
But the sinewy fingers had squeezed hard once, when Andrash had uttered the word 'sold', and then Grandpa had relaxed his grip, his hand falling away from Andrash's wrist. And then Andrash heard a strange sound耀omething that he couldn't, in the first instant, identify at all. When he finally lifted his eyes to his grandfather's face, he realized that the old man had fallen back on his pillows預nd that the strange sound was in fact the sound of laughter. Laughter, which emerged through a rictus of an open mouth, from a face whose skin seemed stretched too tightly over the bones underneath while tears leaked from the corners of the eyes and eyelids which were screwed shut with so much force that the entire eye socket looked in danger of being sucked down into the skull. "Grandpa...?" Andrash said warily, feeling his way back from the wilderness that laughter had flung him into with that carefully chosen word, with the sound of his voice. "Too late," his grandfather said, drawing a long shaky breath. "It's always too late. Oh, dear boy, I was once you. This you, the very you who now stands shivering and confused before me." "You sound...a lot better," Andrash said, taken by surprise at the strength of that voice, of the sudden coherence of those words. His grandfather had not been this strong, this lucid, in days. "Don't be fooled," Grandpa said sharply. "It only means that I am so nearly gone. And I have left it all too late, like my grandfather left it too late for me, and his grandfather for him. I think that is written in the stars. Gods die so very rarely, after all熔ne has a long time to forget, and so it all repeats itself, over and over and over again..."
"I'll get your pills," Andrash said. "Alice said you shouldn't get excited..."
"Maybe it will be Alice, this time around, for you," Grandpa said. "You see, that's how it works熔ne of us lives, young, like you are, and needs a child of his loins預 daughter, to be precise. You will have a daughter, one day, sooner or later. That's the way it always works. And the daughter finds a man葉he kind of man who stays with her only long enough to make a child預nd then that man is gone, and the child is raised by the grandfather. You, by me. I, by my own grandfather. He, by his. That's the way it works." "How old do you think I am, boy?" Andrash glanced at the bedside cabinet. All the paperwork was there, ready, just in case. Grandpa's birth certificate was in there. "You were born..."
"Forget that," Grandpa said, with a small sharp motion of his hand. "Or, rather, remember it, because you will have to deal with the same thing some day. But that birth certificate in there has as little to do with me as it does with the birth of a mayfly. That piece of paper will tell you I was born in a place which I probably never saw, at a time that corresponds to some eighty-odd years or so. But how old do you really think I am, boy?" Andrash stared at the old man. "I don't know," he said. "How old are you?" "Try a thousand years," the old man murmured. "Maybe ten times that. Maybe a hundred times. One loses track, after a while, when one lives in god-years." "Give me that marble," Grandpa said unexpectedly. Andrash gave it up, unwillingly, and Grandpa turned it over in his fingers. "Have you stopped to wonder," he asked, "why this one? Why did you keep this one, out of them all?" "That was the one that I...in my dream..."
Grandpa's bright, beady eyes sharpened. "What dream?" "I am playing with it," Andrash said. "That's a shooter, and I am winning marbles..."
Grandpa laughed again. "Time. Past time. I left it too late, as always遥ou are already waking, and it's time for me to go, for you to take my place." "Take your place?" Andrash said. "What are you talking about?" "No, listen now, because I will only have time to say this once," the old man said. He reached for Andrash's hand, closed it around the blue-and-white marble again, and held his eyes with an intense bright gaze. "This," he said, "this you could not give up because some part of you knew葉his one is your own world. This one, right here, where you stand right now. And given that you were ignorant of what the rest meant, that was the only one that called. But the other marbles葉he one you gave away�"
"I sold them," Andrash said. "I didn't give them..."
"You gave them away," the old man said bitterly. "We always do. I did the same thing. They are worlds, Andrash, my son, my self. They are all worlds, and I預nd, when I am gone, you預re the god of all of them. You are responsible for all of them. And you will not遥ou cannot妖ie until you have got them all back. Every one. They are godless and chaotic worlds now, because you let them slip through your fingers預nd it is up to you to determine how long that age shall last on every one of those worlds. There are such creatures遥ou will see葉here are women with wings of gold, and they will worship you with their body and their mind; there are great creatures who swim in oceans which would be poison to you in your present form but which will be elixir to you when you are among them and they sing their deep-sea songs for you; there are things out of your worst nightmares, with horns and burning eyes, who will burn you again and again and again and give you such ecstasy as you have never known in all of your days; there are entities who live as trees, until you walk amongst them, and then they wake, and dance, and the leaves of their branches shiver and turn to gold as you pass. But all of these things... you have to hold in your possession the world on which they live." "The marbles," Andrash gasped. "All the other marbles are worlds..."
Grandpa nodded. "Yes. And you must get them back, in whatever way you can. Otherwise they are beyond your reach, and lost, and you will never know them." "I will go and buy them back..."
"He will deny he ever saw them, the man who bought them from you," Grandpa said. "You can never buy them back, not for any price. You must win them back now." "The game. The game in my dreams." "Yes. Now seek it in waking." "There was another悠 couldn't see his face, but I saw his hand揺e was a black man, maybe, the skin on his fingers was dark�"
"Ah. He stirs." Grandpa nodded, his face lighting in recognition. "He stirs, too. Perhaps it was his time to go, as well. Be careful of him because he is a worthy opponent預nd the only way past him is to win on his terms." "How many are there?" Andrash gasped. "How can I know that?" "Then how can you know how many gods there are out there?" "But how will I know one when I see him...? Or her?" "You will know," Grandpa said. "Or they will know you. And there will be worlds in play, somewhere." He sighed, and shivered, and closed his eyes. "Cold," he said. "So cold. Alone. It's up to you now, young one. It's up to you. Get them back, or the next time you die...will be your last." "Perhaps that would not be such a bad thing," Andrash said, a little bitterly. Grandpa's eyes fluttered open again. "Oh, young one," he said. "When the time comes to slip away, you will not want to do it. None of us do. That's why we always leave it too late謡e cling, we cling, we cling to the last century, the last month, the last day, the last fraction of a second in the time that is given to us. Even now I feel some part of me fighting it. And yet悠 know悠 have to go. This is yours, now. You gave the worlds away. I couldn't get them back even if I wanted to. It's your task now. Your age starts... right now." He drew another long, shivery breath, and his eyes closed again. "Time to go," he murmured, very softly, his voice barely audible. "Oh, the weight of the worlds熔h, how heavy they were熔h, how much lighter I feel, passing it all on. Time to go, now. Time to die." And he stopped breathing as he exhaled on that last word, and was simply...gone. He would win them back. Every one of them. He would hear all those voices again. They were his葉hey belonged to him預nd he belonged to them. He loved them all, with a fierce love, and was responsible for them all, and craved their adoration in return. He was a god. He was a god. This was what being a god meant. "I will make it right," Andrash muttered. Grandpa had said that, in his delirium, and now, at last, Andrash understood what he had meant預nd it was a vow, and now it was his own vow. "I will make it right. This, I swear." He glanced down to where the blue-and-white sphere, his shooter, his final world, rested innocently in the palm of his hand. His fingers closed around it, his hand balling into a fist, and he lifted the fist up into the air, his eyes hardening as he looked up at the ceiling and through it into the sky above. "I will make it right." There was work to be done. There was a man out there somewhere, a god, playing marbles with a galaxy of worlds. It was time to go find him. Andrash tucked his last world back into his pocket, and strode purposefully out of the house.